They are in their 70s, seemed to have trouble hearing, and appeared to prefer the comfort of casual clothes. One of them wore socks with a pair of sandals. But there they were in federal court in handcuffs Thursday, two alleged members of the New England Mafia, including alleged acting don Antonio L. “Spucky” Spagnolo, charged with threatening to affect business through extortion, a charge that carries a punishment of up to 20 years in prison. Spagnolo, 72, also known as Crazy Eyes, and reputed “made man” Pryce “Stretch” Quintina, 74, allegedly extorted thousands of dollars in protection payments from a video poker machine company and a social club, authorities said. Both men reputedly represent the old guard of the Patriarca crime family, their service dating back to the Mafia’s glory days, when the late boss Gennaro Angiulo controlled the Boston underworld from the 1960s to the early 1980s. 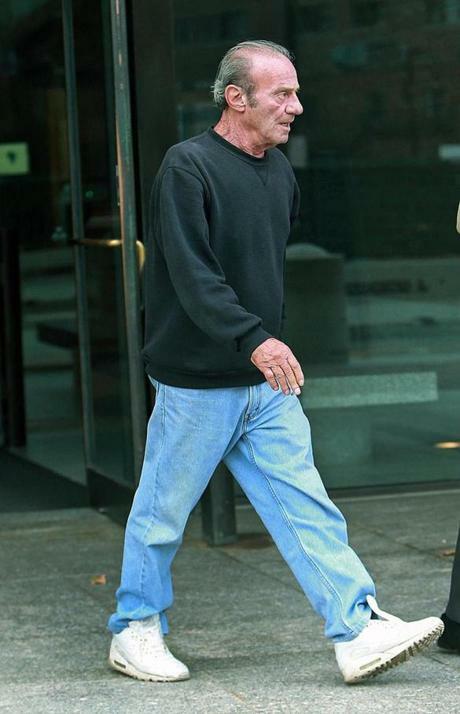 Anthony “Spucky” Spagnolo as he left the Moakley Federal Courthouse Thursday. “They go back in history,” said State Police Detective Lieutenant Stephen P. Johnson, who used to run the unit that investigates organized crime. He said Spagnolo was deeply involved in drug dealing, a capo in the family. Quintina was a Mafia soldier, but his uncle Charles “Q-Ball” Quintina, was also a capo. Spagnolo and Quintina have shown their loyalties before, maintaining in court hearings in the early 1990s that they were not “made” members of any crime family, even as they pleaded guilty to Mafia-related activities. Both men were allegedly at the infamous October 1989 Mafia induction meeting in Medford that was secretly recorded by the FBI. Now, authorities say that Spagnolo has been serving as acting boss of the fragmented crime family, a skeleton of what the organization once was. Former boss Anthony L. DiNunzio was sentenced in Rhode Island in 2012 to 78 months in prison for racketeering. He is the brother of Carmen “The Big Cheese” DiNunzio, who was sentenced to prison in Massachusetts for bribery. Luigi Manocchio, Anthony DiNunzio’s 86-year-old predecessor, was sentenced to 5½ years in prison for extorting protection payments from strip clubs. And Mark Rossetti, one of the most feared captains in the New England mob, is in prison in Massachusetts for extortion and bookmaking. Spagnolo and Quintina have served prison terms themselves. Spagnolo pleaded guilty to numerous racketeering and drug dealing charges in 1991 and was sentenced to nine years. Quintina was sentenced in 1995 to 7½ years. He was charged with setting up Angelo Patrizzi for murder in 1981, though he pleaded guilty to racketeering charges in an agreement with prosecutors. In the most recent case, Spagnolo allegedly ordered Quintina to collect monthly protection payments from the owners of a video poker machine company, Constitution Vending Co., totaling more than $50,000 between 2004 and 2012. For years, according to a federal indictment unsealed Thursday, Constitution installed video poker machines in bars and social clubs for use in illegal gambling and split the proceeds with the bar owners. One of Constitution’s machines was installed at the Revere Moose Lodge, the indictment alleges. The Mafia allegedly protected Constitution’s business by driving out potential competitors, according to an indictment unsealed Thursday. But, according to the indictment, the Moose Lodge negotiated a deal with a new company, to receive larger profits. Spagnolo allegedly met with those involved and threatened that he would not permit them to remove Constitution’s machines from the Revere Moose Lodge. “As a result of defendant Anthony Spagnolo’s meeting with and threats, [the victims] did not install [new] video poker machines at the Revere Moose Lodge,” the indictment alleges. Spagnolo and Quintina were released to their homes Thursday and must wear electronic monitoring bracelets. “There are some risk factors, giving the nature of the charges and the defendant’s criminal history,” Assistant US Attorney Seth B. Kosto said in court, referring to Spagnolo.